What's This Weird "Tool" Just Unearthed in a Time Capsule From 1927? 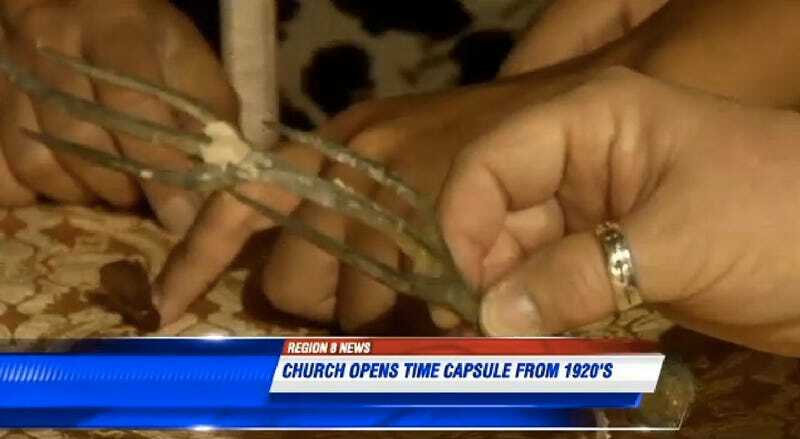 As promised, that church in Jonesboro, Arkansas opened their mysterious 1920s time capsule this past Sunday. There were some of the usual suspects inside: some coins, some old newspapers... and some weird doublefork thing that has no explanation. Seriously, what the hell is that thing? I wouldn't be so interested in it if the local news didn't just gloss over it so quickly. They called it "some sort of tool nobody could identify."